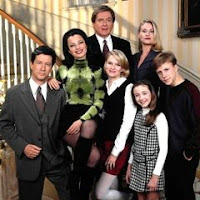 The Nanny is an American Situation Comedy that revolved around Fran Fine (Fran Drescher), a former bridal consultant who found herself mistaken by widowed Englishman, Broadway producer Maxwell Sheffield (Charles Shaughnessy) to be applying for the job of nanny to the Shefield children. Fran soon, with her offbeat nurturing and no-nonsense honesty, touched and became quite attached to Maxwell, the kids, Maggie (Nicholle Tom), Brighton (Benjamin Salisbury), and Grace (Madeline Zima) and becoming great friends with the butler, Niles (Daniel Davis). In the shows 6 season run, it garnered a total of 4 awards and 33 nominations. The Nanny also featured a large number of guest stars over the years like Pamela Anderson, Chevy Chase, Elizabeth Taylor, David Letterman, Donald Trump, Celion Dion, Elton John, Whoopie Goldberg, Rosie O'Donnell among others. The Nanny Homepage This site is devoted to fans of the comedy THE NANNY, which runs on CBS Television. The Nanny - Official Site The official site of the CBS TV sitcom The Nanny.